The University of Michigan’s new, interdisciplinary Data Science Master’s Program is taking applications for its first group of students. The program is aimed at teaching participants how to extract useful knowledge from massive datasets using computational and statistical techniques. The program is a collaboration between the College of Engineering (EECS), the College of Literature Science and the Arts (Statistics), the School of Public Health (Biostatistics), the School of Information, and the Michigan Institute for Data Science. “We are very excited to be offering this unique collaborative program, which brings together expertise from four key disciplines at the University in a curriculum that is at the forefront of data science,” said HV Jagadish, Bernard A. Galler Collegiate Professor of Electrical Engineering and Computer Science, who chairs the program committee for the program. “MIDAS was a catalyst in bringing faculty from multiple disciplines together to work towards the development of this new degree program,” he added. MIDAS will provide students in this program with interdisciplinary collaborations, intellectual stimulation, exposure to a broad range of practice, networking opportunities, and space on Central Campus to meet for formal and informal gatherings. For more information, see the program website at https://lsa.umich.edu/stats/masters_students/mastersprograms/data-science-masters-program.html, and the program guide (PDF) at https://lsa.umich.edu/content/dam/stats-assets/StatsPDF/MSDS-Program-Guide.pdf. Parkinson’s disease (PD) is a degenerative disorder of central nervous system that mainly affects the motor system. Currently, there is no objective test to diagnose PD and the bedside examination by a neurologist remains the most important diagnostic tool. The examination is performed using the assessment of motor symptoms such as shaking, rigidity, slowness of movement and postural instability. However, these motor symptoms begin to occur at a very late stage. Smartphones and smart watches have sensitive sensors (accelerometer, gyroscope, and pedometer) that can track the user’s motion more frequently than clinical examinations at much lower cost. While the movement information is recorded by the sensors, the rough sensor data is hard to interpret and give limited help to PD diagnosis. In the Parkinson’s Biomarker Challenge, we are tasked to extract useful features from time series accelerometer and gyroscope data. The data of Challenge 1 consist of ~ 35000 records collected from ~ 3000 participants with phone APP in their daily life. The final goal is to predict whether a participant has Parkinson’s disease or not. The data of Challenge 2 consist of records from ~ 20 patients doing different tasks (such as drinking water, folding towels, assembling nuts and bolts etc.). And the goal is to predict how severe is the limb action tremor. The highest ranking the team received was 4th place in Challenge 2. 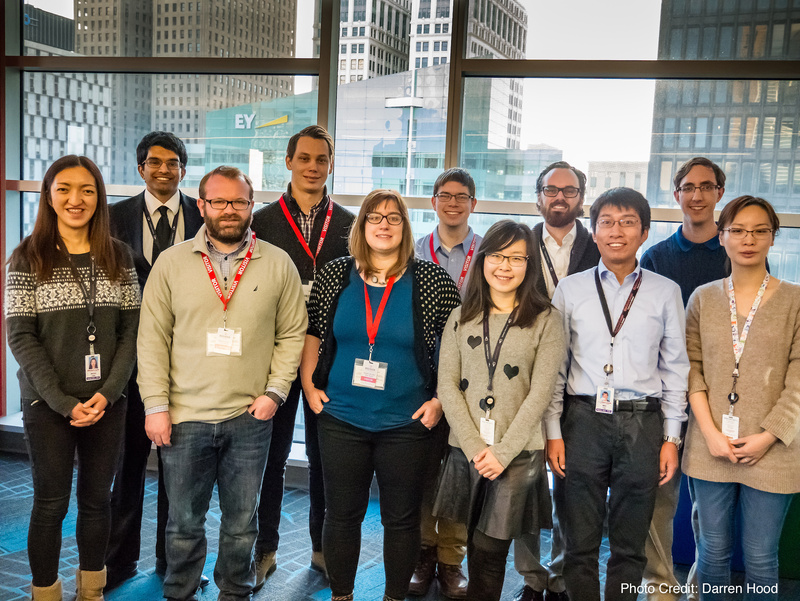 Earlier this year, three Data Science Team (MDST) members — winners of the Quicken Loan (QL) Lending Strategies Prediction Challenge — traveled to Detroit to visit QL headquarters, accept their prizes, and present their findings to the company’s Data Science team. Front row left to right: Jingshu Chen, Patrick, Alex’s wife Kenzie, Yvette Tian, Mike Tan, and Catherine Tu. 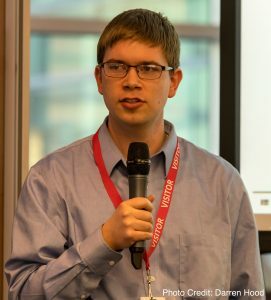 Alexander Zaitzeff, a graduate student in the Applied and Interdisciplinary Mathematics program won first place; Alexandr Kalinin, a Bioinformatics graduate student earned second; and Patrick Belancourt, a graduate student in Climate and Space Sciences and Engineering took third. The goal of the competition was to create a model that would predict whether potential clients would end up getting a mortgage based on the loan product originally offered to them. In order to create this model, each participant was given access to proprietary de-identified financial data from recent QL clients. The accuracy of their models was then evaluated on one month of client data. “This was a very valuable competition because it gives people experience working with real datasets, on actual problems that companies work on day to day,” said Jonathan Stroud, organizational chair of MDST. About 20 people from QL’s Data Science team gathered to hear how the MDST winners developed their models, as well as vice presidents of the Business Intelligence unit. The winning entry was an “ensemble model,” in which several models are synthesized into one predictive framework. Finding that so many different kinds of models performed similarly was a confirmation that “the data tells the story,” Ball said. “Allowing for each technique to contribute more strongly to the final score in areas where the model type performs well (referred to as “blending” or “stacking”) is an especially strong method and one we should consider moving forward,” he said. The competition began in September and ran until the end of the Fall semester. Over 70 students competed in this challenge, including both graduates and undergraduates from several schools and departments across the University. 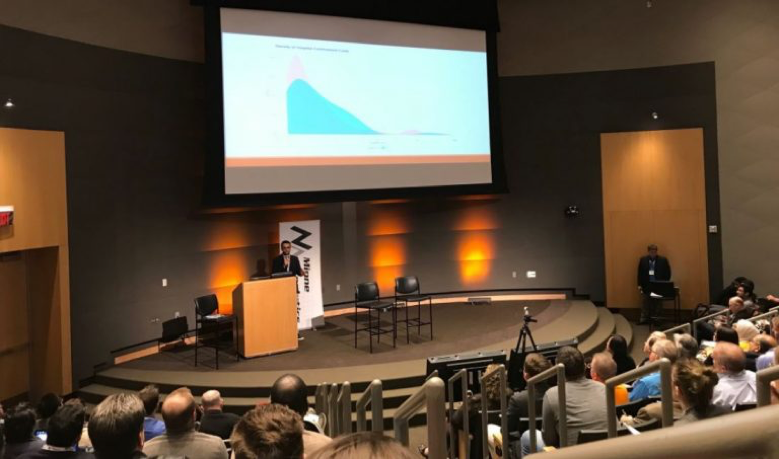 We represented the Michigan Data Science Team (MDST) in the Midwest Undergraduate Data Analytics Competition hosted by MinneAnalytics in Minnesota. We were provided insurance claims data for people diagnosed with Type-II diabetes. At the novice level, the goal was to use this data to find meaningful patterns in age group, gender and geolocation for patients with Type II Diabetes. This information would then be further used to generate cost-saving mechanisms. Through our meetings with MDST members, we realized that most teams would be approaching this problem with the purpose of predicting the diagnosis or finding patterns in the comorbidity. To stand out, we decided to focus on finding the sub-populations who have the highest cost after day 0 being of diagnosed with type-II diabetes. We performed K-means clustering on claims in medical_training.csv to find generalized patterns among different groups. The entries in medical_training.csv contain medical claims for each hospital visit for a patient. A patient will have multiple entries if he/she visited the hospital more than once. In each entry, there were at most five ICDM-9* diagnosis codes for each visit. It contains five characters that are mostly numbers, e.g. “12345”. This code can be grouped into 19 categories of diseases and each category contains a range of codes. The first preprocess step we performed was to “shrink” the number of rows. We used patients ID to group each diagnosis to each patient. After that we constructed a 0/1 indicator feature vectors of length 19. Each column represented a type of disease and the value on that column would 1 if the patient was diagnosed with that disease. Each row in the feature vector contains the information of a particular patient’s diagnosis. After making the data into feature vectors, we can know perform k-means clustering. . k-means clustering is partitioning observations into a finite number(k) of clusters or groups in which each observation belongs to a cluster with the nearest mean. However, we still need to decide the number of clusters k. We want to find the number of clusters that result in small intracluster distance but do not overfit the data. To do this we used the “elbow heuristic”, which states that if on plotting the cost of k-means(the sum of the intracluster distance) with respect to k, we should choose a k value that has a significant drop before the that point and no significant drop after that point. 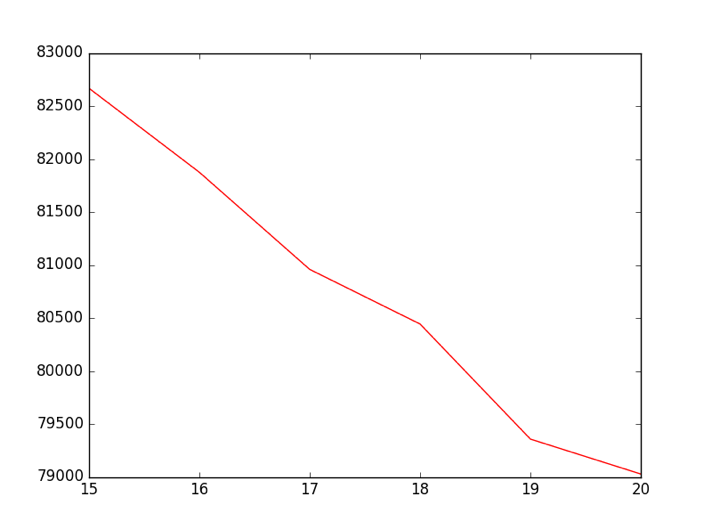 As in the graph above, where the x-axis is the value of k and the y-axis is the cost of k-means clustering, we can see that k=19 is a good choice. From the data analysis we performed, we realized that the average cost of each visit for a patient remained the same regardless of when the hospital visit occurred, but the amounts of visits increased significantly after the day that they were diagnosed. 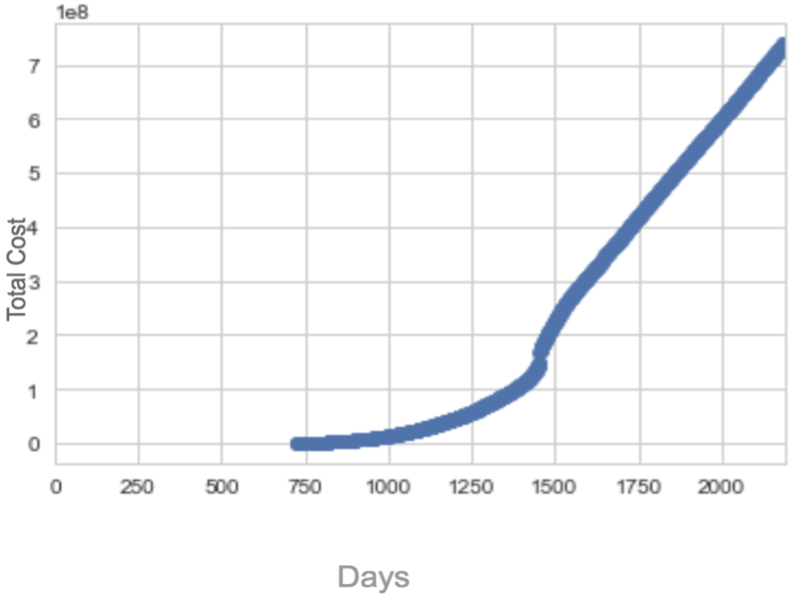 This resulted in a significant increase in the total cost, as can be seen in the graph below. Another interesting finding was that although the number of patients diagnosed with Diabetes-II increased with age, the average cost was highest for ages 20-25 and 45-50, as shown in the graph below. This trend was common among different clusters. From this data, we were able to conclude that the people who were diagnosed in those two age groups had similar diseases. This suggests that we should focus on the age group who are diagnosed with diabetes at this younger ages will have a significantly higher cumulative costs as they live their life. From this competition, we learned that it was important to style our slides for the presentation. The judges commented us as “one of the most technical solid presentation”. However, we made some mistake on the slides and some axes on the graph are not clearly labeled. As a result, we did not make to the finalis. Nevertheless, it was really encouraging to know that the judges were impressed by our analytical skills. But beyond that, at the competition itself we were impressed by the various interesting ways that the upper level teams used to predict the highest at-risk patients. One of them used models similar to what credit-card companies use to predict credit ratings for its clients. This was definitely out of the box and I was surprised to see that it actually worked. And finally, we realized that it is important to persist. We encountered a significant delay before we received the real data(in fact, we did not have it until 5 days before the competition). It was challenging to try to come up with good analysis in that short period of time. 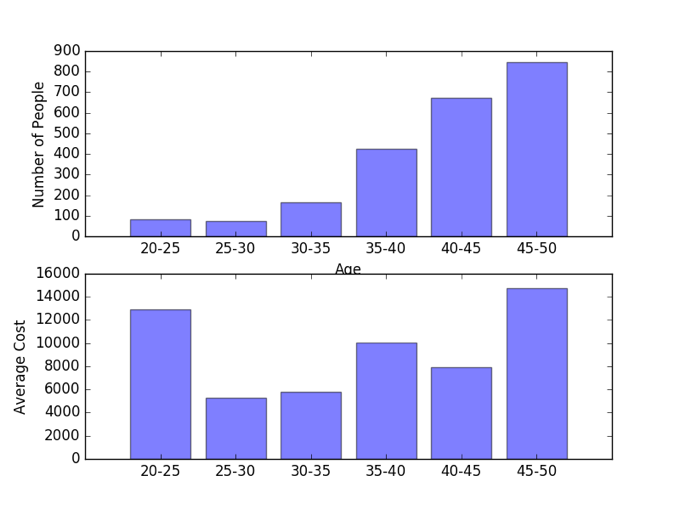 However, with the help of our faculty mentor Sean, we were able to find meaningful patterns in the dataset. We wish we can have more time so that we can explore trends in other dataset. A series of training workshops in high performance computing will be held Feb. 12 through March 6, 2018, presented by CSCAR in conjunction with Advanced Research Computing – Technology Services (ARC-TS). Location: East Hall, Room B254, 530 Church St. Location: East Hall, Room B250, 530 Church St. Learn how to process large amounts (up to terabytes) of data using SQL and/or simple programming models available in Python, R, Scala, and Java.